Line cookie sheet with waxed paper. In medium bowl, stir together corn, onions, mayonnaise, taco seasoning mix and crabmeat. Shape into 8 patties, using slightly less than 1/4 cup for each patty. Place on cookie sheet; freeze 15 minutes. Heat oven to 450°F. Spray another cookie sheet with cooking spray. In shallow bowl, stir together egg and water. In another shallow bowl or pie plate, place bread crumbs. 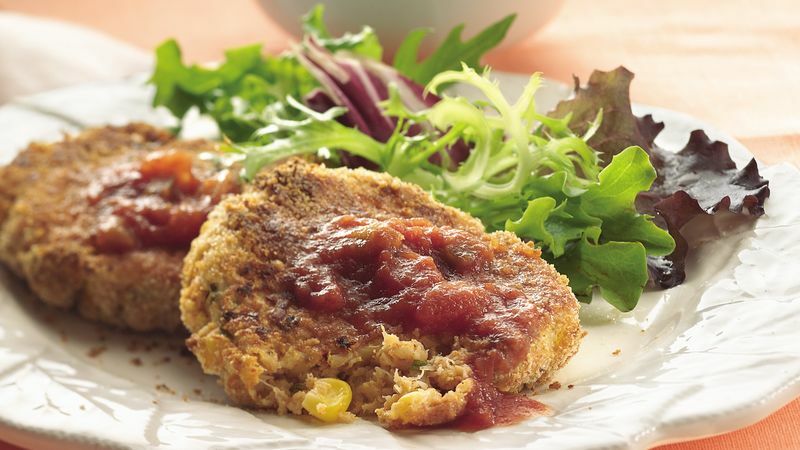 Dip each patty into egg mixture, coating both sides, then coat with bread crumbs. Place on cookie sheet. Bake 15 minutes; turn patties. Bake about 10 minutes longer or until golden brown. Serve with salsa. The fat-free mayo in this recipe provides moisture and tenderness without the 11 grams of fat per serving of regular mayonnaise. If you want to reduce the fat even further, use 1/4 cup fat-free egg product instead of the egg. Use a fork or small spatula to turn the patties when coating them with the egg mixture and bread crumbs.